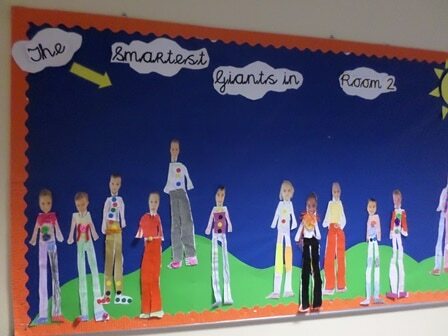 Junior Infants Room 2: The Smartest Giants in Room 2! Room 2 has been taken over by the smartest little giants who have been very busy practicing and writing their new numbers and sounds this week. They have been reading the brilliant story of ‘The Smartest Giant in Town’, learning all about the characters in it, and talking about how kind the giant was to his friends. They made masks to act out the story with, worked with their elbow buddies to build and find their way around the giant’s town, going backwards, forwards, over, under and around the bridges and rivers, and even made themselves into smart little giants using lovely materials Vinny left for them as a surprise- they may be short giants but they have very long legs! They have also been learning all about clothes and the weather this week, made their own weather wheels, and learnt a new ryhme about a little boy who was so tired he got all of his clothes mixed up before going to bed! Well done Room 2, what a smart little bunch of giants you are! For more photos of these smart little giants at work see here.